PHOTO BY JILL GOSCHE Columbian's Kesean Hatlay puts pressure on Ashland's Mitch Heilman during the game at Frost-Kalnow Stadium Friday. It’s impossible to say how Friday’s game between Columbian and Ashland would have turned out had TC coach Judd Lutz decided to just have Parker Johnson kick the ball. After rallying from an early 14-0 deficit to get within four points of the Arrows at half, things had gone a little sideways for Columbian in the third quarter. Ashland took the second half kickoff and marched 84 yards in a hurry-up offense, and extended its advantage to 21-10 when quarterback Mitch Heilman went around the right side for a 2-yard touchdown rush. The ensuing Columbian possession appeared to have stalled at about midfield. And facing a fourth down and six, Lutz sent out Johnson and the punt team. But when the ball was snapped to Johnson, he lofted a short pass to Robert Daniel, who caught the ball and rolled eight yards before being forced out of bounds. Later in the drive, Columbian had a pair of touchdowns — a pass to Johnson and a run by Nick Jackson — negated by an illegal block and a chop block. Facing a first-and-28 from their own 47, the TC coaching staff again went with some trickery. The Tornadoes ran a reverse to Donnell Brockington, who seemingly had the entire right side of the field to himself. He went all the way to the end zone, and Ashland’s lead was down to 21-17 with 6:01 left in the third. And from there, Columbian took off. Quarterback Chase Frankhauser completed touchdown passes to Brockington and Ryan Sharpe, part of a 21-point spurt that pushed the Tornadoes to a 31-28 win. After going winless a year ago, the Tornadoes are 2-1. They play at Toledo Start next week. Maybe most encouraging for the Tornadoes was that they were far from their best. 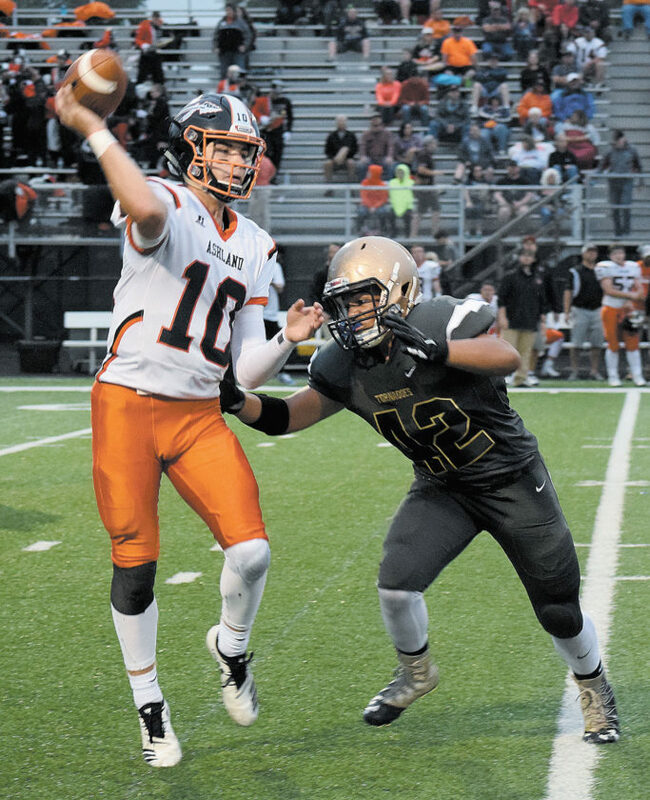 Frankhauser went through a very rough stretch late in the first quarter and into the second, in which he threw three straight passes that were intercepted. His first one came when he threw a pass down the right sideline, only to have it go off a receiver’s hands and be picked by Ethan Deere at about the Columbian 38. That one didn’t hurt the Tornadoes, because on the next play, Ashland Heilman was picked by Brockington inside the 10. But it proved a temporary reprieve. Facing a third down and eight from its 12, Frankhauser attempted a short pass on the left side. Ross Garrison jumped in front of the receiver and made an interception. And that set up points. Heilman hit Cade McQuate on a fade to the right corner of the end zone with three seconds left in the first quarter. Now leading 7-0, Ashland’s defense got another big play. This time, a Frankhauser pass was tipped and grabbed by the Arrows’ Tim Flint. Heilman moved the ball to the TC 12, then, facing a fourth and goal, he cashed in again, throwing a strike to Mason Kanz. But Frankhauser shook off the start to run for 140 yards on 20 carries, while throwing for 110. Columbian rallied on a 37 yard second quarter touchdown run by Jackson, and a 32-yard field goal by Johnson just before the break. Jackson had a nice game, running for 81 yards on 13 carries. And Brockington was terrific, finishing with 58 total yards to go with a pick. Down 10 after Sharpe’s touchdown catch — which came on a fourth and long — with 6:09 to go, Ashland rallied for a touchdown when Flint hauled in a 15-yard TD pass from Heilman with 2:16 left. Out of timeouts, the Arrows were forced to try an onside kick. It went out of bounds, and Columbian was able to run all but nine seconds off the clock. A Johnson punt — a real one, this time — ran out the clock without incident. Ashland dropped to 2-1. Heilman finished with 208 yards passing and three TD passes. Kanz finished with 14 catches for 135 yards. Ashland coach Scott Valentine said the fake punt was key.